Bridgestone E6 Yellow are selling in the pro shops for up to $45 a dozen. Save serious money and play one of the most popular balls in the game. The e6 is one of the most popular balls in the game and is used by many golfers from new beginners all the way through to experienced competition players. The reason for its popularity is that the ball provides significant spin reduction which results in longer straighter drives and iron shots. Because of this reduced spin players how are known to hook or slice the ball can find the fairway more often and more consistently. 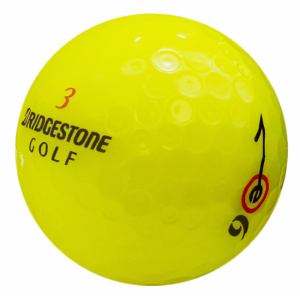 Anyone who is looking for a ball to counter side spin should seriously consider the Bridgestone e6 whose inner layer is designed to do just that. The e6 promotes long and straight flight while its angle of descent is fairly low so there is the added advantage of roll. The controlled flight ensures that it will not be subject to slice or hook, just fade or draw. The soft core and cover combine to provide good feel around the greens to help you convert your added distance to improved scoring. Golf balls are not cheap especially if they keep getting lost. The e6 will ensure that you can be more confident of keeping the golf ball in play and for that reason alone, the e6 is worth a try. Golfers who currently play with balls such as the Titleist NXT, Callaway Warbird, Srixon Trispeed, Nike PD Long and the Taylormade Burner will appreciate the similar characteristics of the e6. What has made the e6 stand apart from these other golf balls is the way in which the side spin experienced in the air has been minimised. This really is a feature that allows these golf balls to appeal to many golfers who have slight areas of their game which can be improved. At Lost Golf Balls all our e6 are hand sorted to ensure quality. If you are looking to grab some bargain used Bridgestone golf balls then you have come to the right place! The balls were in great condition and play like new balls. all good, easy trade very fair price ,very good quality balls , very Happy and will buy more . Thanks . Brilliant product and superb delivery service. These balls are so close to new it isn’t funny. Product, price and punctual delivery is why i use Lostballs and will continue to use and recommend Lostballs. I like their grading system.It is as described. Good follow up and communications. I am a first time user of this group. Have used others before on a number of times. Will be my go to group for golf balls. Why buy new when you can get this quality at such good price. Excellent. Great balls that turned up where i live at the other end of the country in just a couple of days time! Totally recommend this service. cheers mate glad you liked the E6 Yellow's. We're try to keep the grading of them as sharp as possible to good to hear you approve of the quality. Hit em straight and Happy Golfing! fantastic service, think I got them in two days all the way to Perth. I was delighted with the balls delivered next day , and advised my club members of the good service. Bridgestone e6: The Softest Multilayer On The Market Bridgestone E6 Yellow are selling in the pro shops for up to $45 a dozen. Save serious money and play one of the most popular balls in the game. The e6 is one of the most popular balls in the game and is used by many golfers from new beginners all the way through to experienced competition players. The reason for its popularity is that the ball provides significant spin reduction which results in longer straighter drives and iron shots. Because of this reduced spin players how are known to hook or slice the ball can find the fairway more often and more consistently. Main Features Of The Bridgestone E6 - surlyn cover for added softness - side spin reducing inner layer - 330 dimple design - gradational compression core for longer straighter shots Anyone who is looking for a ball to counter side spin should seriously consider the Bridgestone e6 whose inner layer is designed to do just that. The e6 promotes long and straight flight while its angle of descent is fairly low so there is the added advantage of roll. The controlled flight ensures that it will not be subject to slice or hook, just fade or draw. The soft core and cover combine to provide good feel around the greens to help you convert your added distance to improved scoring. Golf balls are not cheap especially if they keep getting lost. The e6 will ensure that you can be more confident of keeping the golf ball in play and for that reason alone, the e6 is worth a try. Golfers who currently play with balls such as the Titleist NXT, Callaway Warbird, Srixon Trispeed, Nike PD Long and the Taylormade Burner will appreciate the similar characteristics of the e6. What has made the e6 stand apart from these other golf balls is the way in which the side spin experienced in the air has been minimised. This really is a feature that allows these golf balls to appeal to many golfers who have slight areas of their game which can be improved. At Lost Golf Balls all our e6 are hand sorted to ensure quality. If you are looking to grab some bargain used Bridgestone golf balls then you have come to the right place!